This past winter was so hard that I intend to keep celebrating the arrival of spring for as long as I can get away with it. Clearly, nothing says spring better than cherry blossoms. 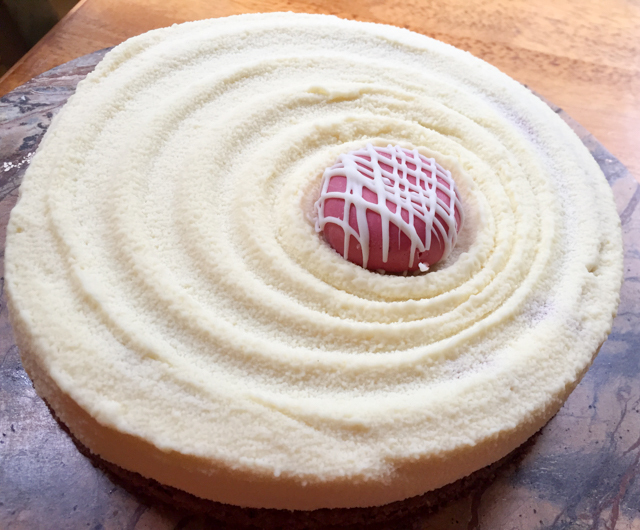 In this cake, my goal was to have a creamy sakura-flavored mousse involving a fruity center, as a red fruit compote. For the base of the dessert, I made a crusty layer with puffed quinoa, the new (to me) ingredient I mentioned in my last post. 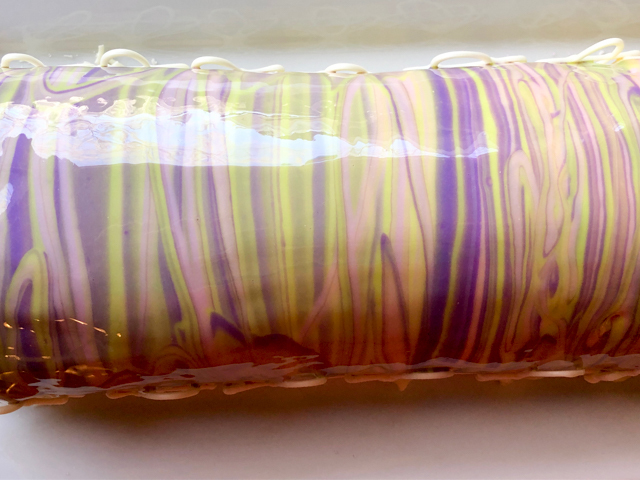 To finalize, a pastel-colored mirror glaze action, in pink, purple and green. Why the French name? Because it is irresistibly poetic, that’s why. Two days before serving, make the biscuit and the cherry compote. For the biscuit: In the bowl of a Kitchen Aid mixer fitted with the leaf blade, beat the eggs, sugar an almond flour together for 4 to 5 minutes. Transfer to a mixing bowl, and after thoroughly cleaning the bowl of the Kitchen Aid, whisk the egg whites until you can see if forming a trail as the whisk goes through them. At this point, slowly rain the fine sugar to form a soft-peak meringue. Add the meringue to the egg-sugar-almond mixture previously made. Mix gently with a spatula. Add the flour gently, sifting it over the mixture. Finally, add a bit of the mixture to the melted butter, make a smooth emulsion with it, and pour it into the batter. Mix as gently as possible. Spread the batter on a baking sheet lined with parchment paper as a layer a little over 1/2 inch thick, and bake for 12 minutes at 380 F. Once the biscuit is cool, cut the rectangle needed to fit the smaller buche. While the biscuit cools, make the compote. For the compote: Soak the gelatin sheets in a bowl of cold water for at least 10 minutes. Place the eggs, honey, fruit puree and heavy cream in a bowl and whisk with an immersion blender (or use a regular blender if you prefer). Pour the mixture in a saucepan and bring the temperature to 180 F, stirring constantly and never using too high heat. Remove the pan from the stove, add the drained gelatin, and mix. Let it cool for about 10 minutes and add the softened butter, mixing again until well incorporated. Pour into the mold, then gently add the biscuit on top, pressing gently. You don’t want it to submerge, just float on the surface. Wrap the top of the mold with plastic and freeze overnight. Make the quinoa-crisp. Bake the puffed quinoa in a 325 F oven for 10 minutes. Meanwhile, melt the white chocolate in a microwave very gently. Mix the melted chocolate with the pistachio paste. Add the quinoa and spread in a 4 mm (1/8 inch) thickness in between two sheets of parchment paper. It will be a little sticky, try to level it as best as you can. When it is cooled down a bit, cut the exact dimension of the bigger mold you will use for the dessert. Reserve. Make the Sakura mousse. Soak the gelatin sheets in cold water for at least 10 minutes. Bring the milk to almost boiling and add the sakura leaf powder, mixing well to dissolve. Let it sit covered for 10 minutes. In a small bowl, whisk the egg yolks with the sugar. Slowly add the hot milk infused with the sakura powder, whisking constantly. Transfer back to the pan and heat gently to 180 F. Do not let it go over or you will scramble the egg yolks. Transfer to a bowl, let it cool for a couple of minutes and add the drained gelatin and the Sakura extract. Reserve. Whip the cold heavy cream to very soft peaks, do not over whip it. 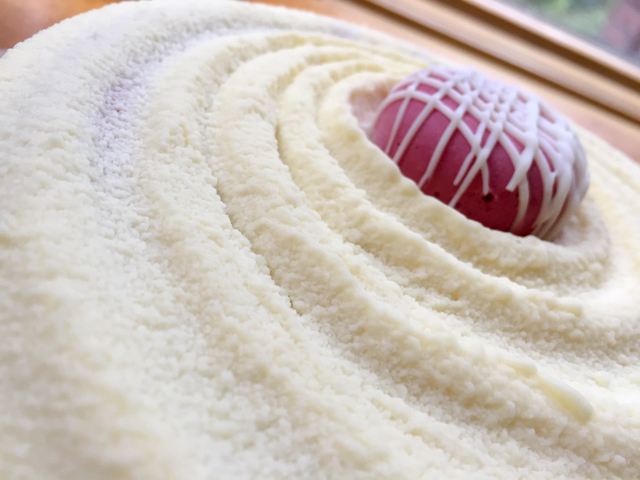 When the sakura custard is barely warm to the touch, add the whipped cream to form the final mousse, fold with a spatula until smooth. Pour the mousse into the large Buche mold up to 1/3 of its volume. Add the frozen insert made the day before, with the biscuit layer up. Complete the mold with mousse almost to the top, place the quinoa crisp on top, pressing gently. Wrap with plastic and freeze overnight. Make the mirror glaze. Place the gelatin sheets inside a bowl with cold water for 10 minutes as you prepare the other ingredients. In a sauce pan, heat the glucose, sugar and water until boiling. Make sure the sugar is fully dissolved. Let it cool slightly, and add to a bowl with the white chocolate in small pieces. After a few minutes, use a spatula to dissolve the chocolate. 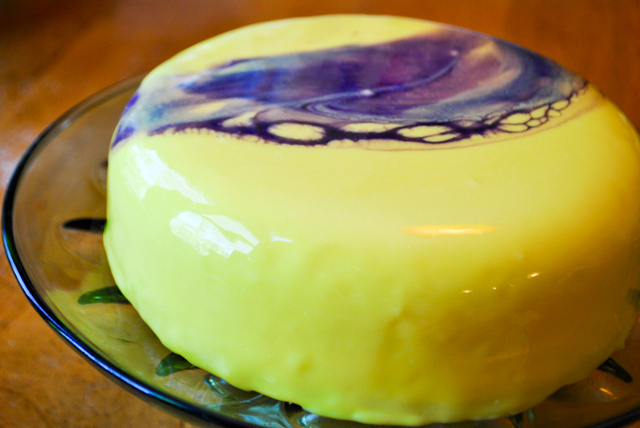 Add the gelatin and the condensed milk, and mix gently, try to avoid incorporating air bubbles. Add the titanium oxide and emulsify the mixture with an immersion blender to get rid of bubbles. Divide the mixture in three bowls. Eyeballing is fine. Add the color and mix very gently with a spatula, do not use a whisk to avoid incorporating bubbles. Cover with plastic touching the surface and place in the fridge overnight. To glaze, warm up the mixtures in the microwave for 30 to 40 seconds. Pass them each through a fine sieve to remove any residual bubbles. When the mixtures are at 98 F you can pour them in a tall pitcher, one color at a time, working fast so that the temperature does not drop too much. Glaze the frozen dessert allowing all colors to mix and mingle. Thaw the cake in the fridge for a couple of hours before serving. Decorate the sides if you like, with tempered white chocolate or candy melts. Comments: The dessert was assembled in a set of Silikomart molds called “Buche.” They can be used either separately, or together in a way that the smaller mold makes a component that goes inserted in the bigger one. 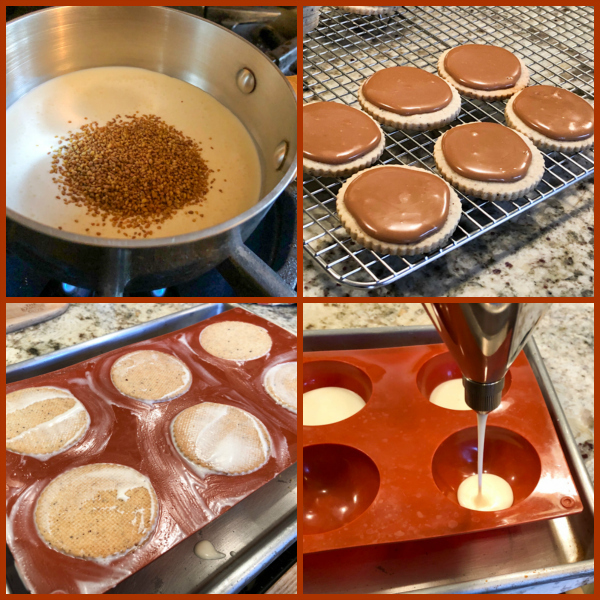 When planning a dessert using two molds, the first thing to consider is the volume needed, keeping in mind that a great deal of space will be occupied in the larger mold by the insert previously made. The amounts I shared work well with the Buche set. The composite photo above shows the overall preparation of the insert (compote + biscuit), that I made on a Friday evening, and left to freeze until next day. You can use any type of freezer-safe container you want, as long as it allows for easy un-molding later. 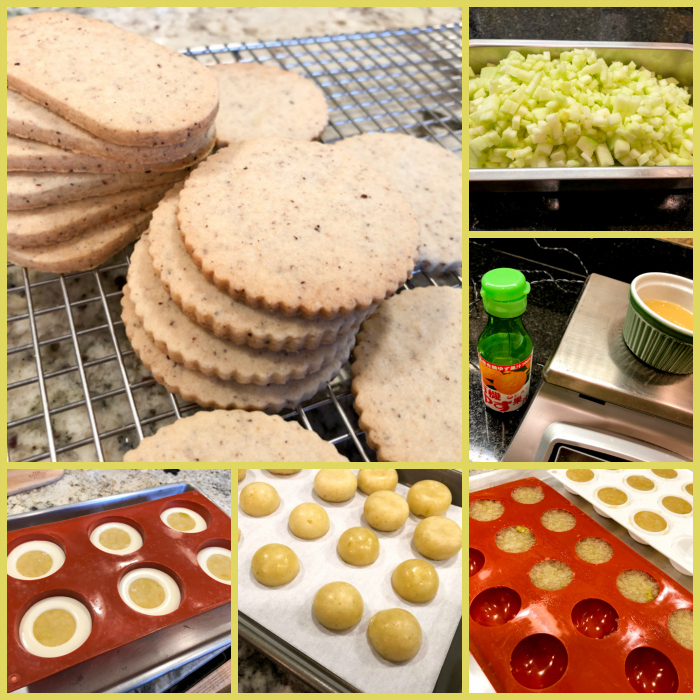 The biscuit recipe makes more than needed for the base, so I cut a few rounds to freeze for a future adventure. 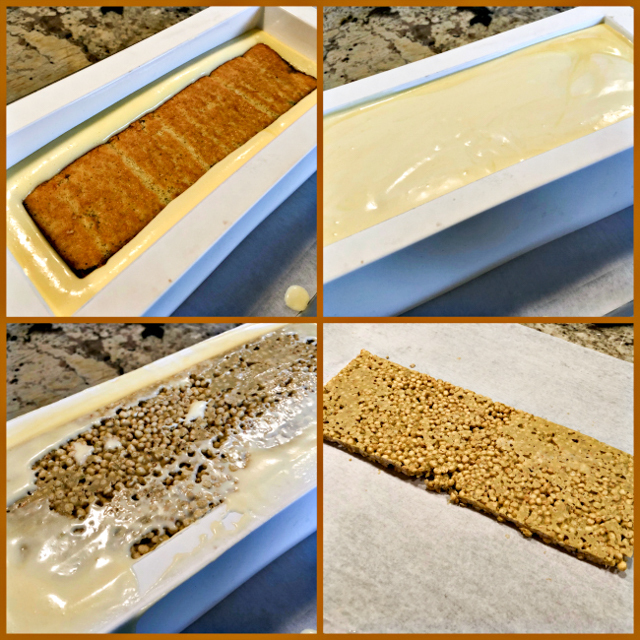 Saturday morning I made the crusty layer using puffed quinoa. To do so, I drew a precise template of the bigger Silikomart mold, and used a sharp paring knife to cut it. It is easier to cut while it’s still just a tad warm. While the layer cooled completely, I prepared the Sakura mousse. The mousse is poured inside the larger buche mold, then the frozen insert carefully placed in the center, with the biscuit layer facing up. More mousse is used to fill the mold almost to the top, then the crusty layer is gently pressed on top. It is important to wrap the mold in plastic wrap so that when the mousse freezes it gets nicely compacted around the insert and the quinoa top (which will become the bottom in the final presentation). Mirror glazing is definitely the most exciting part, although still a bit nerve-wracking for me. Things can go wrong in this final step for two main reasons: first, you can pour too fast and lose track of how much glaze is being used, how much is left to finish coating; second, the temperature might be slightly off, so either the glaze slides off the cake without sticking, or it might set too fast and compromise the beautiful, super smooth surface that is the goal. When using more than one color, it gets even trickier. All components have to be just right in consistency and temperature. The glazes are best made the day before, so I made them on Saturday, kept them all in the fridge. A 30 to 40 seconds encounter with the microwave puts all glazes at around 110F. At that point they went inside my bread proofing box set at 98F, and the waiting game started. You must be patient, and remember that whisking a mirror glaze suspension is a capital sin in patisserie. Bubbles must be minimized at all cost. Allow the different colors to equilibrate to the same temperature, get your frozen dessert ready, and let your inner Monet fly. So there you have it, the Sakura Buche du Printemps ready to be enjoyed! The cherry blossom flavor is very unique, floral (obviously) but not overpowering, as long as you exercise caution when you add it. A little too much and the mousse will be ruined. I really liked the texture of the crunchy quinoa, an idea that I cannot take credit for. I found it in this blog post and simply “borrowed” it. I will be using it again and again. It is sturdy enough to support the mousse, but easy to cut without making a huge mess on the plate. The biscuit layer could conceivably be omitted to simplify preparation, but it does add a different texture in a sea of mousse and creamy fruit. I think it makes the dessert considerably more interesting. Don’t even get me started on my thoughts about this winter. It drags, it is unbearably cold, snowy, pathetic. You may be reluctant to take the word of a Brazilian about it, but I quote my beloved husband, the Michigander: this is the worst winter we’ve had in 10 years. So there. He said it. I had no choice but to make a cake that brings the colors and brightness of Spring to the table, hoping to coach the weather into following suit. A cookie base, a chocolate genoise layer, a blueberry compote, all surrounded by a smooth lemony mousse. Want to know what makes me very happy? It is my very own recipe. Take THAT, former cake-o-phobe self! Heat the oven to 350 F. In a bowl beat the butter, the powdered sugar and the vanilla sugar until light and fluffy. Add the egg yolks, one by one, constantly beating. In another bowl sift the flour and baking powder and add to the previous mixture. Finally, add the almond flour. Stir very well. The dough does not get too thick or too liquid, the texture must be creamy. Spread the dough as a circle, about 1/8 inch thick, smooth the surface with a spatula. Bake for about 15 minutes (depending on the oven) or until golden brown. Remove from oven and let cool slightly. Then, cut a circle just slightly smaller than the diameter of your silicone mold. Make sure it fits snuggly into the opening of the mold. 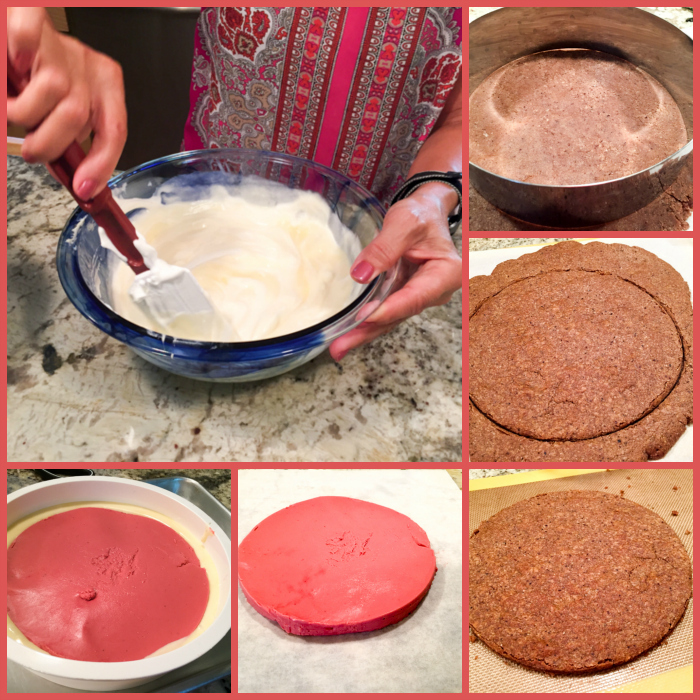 Heat the oven to 350 F. Line the bottom of two 8″ cake pans with a parchment round. Melt the butter in a small saucepan, transfer to a bowl and reserve. Sift together the flour and cocoa, set aside. Put the eggs and sugar in a mixer bowl. Set the bowl over a pan of simmering water and whisk until the eggs are lukewarm. Put the bowl onto the mixer and whisk until the eggs are tripled in volume. Sift half the flour/cocoa over the egg mixture and use a balloon whisk to fold, repeat with the remaining flour/cocoa. Whisk a little bit of the batter into the melted butter, and add the vanilla extract. Fold the butter mixture into the rest of the batter. Fold gently to avoid deflating the mixture too much. Divide the batter evenly between the pans. Bake until the cake springs back when pressed in the center, about 30 minutes. Cool in the pan for 10 minutes before turning out onto a cooling rack. Slice the cake in half lengthwise to the thickness you want for your entremet. I cut it a little less than 1 inch thick. Leftover cake can be frozen for a few months, well-wrapped in plastic. Add the gelatin sheets into a bowl with very cold water and let it sit for 10 minutes. In a small sauce pan, cook the blueberry puree with the sugar until the sugar is fully dissolved. Add the bergamot essence, check that the temperature is below 175 F, then add the softened gelatin sheets, well-drained from the water. Mix well. 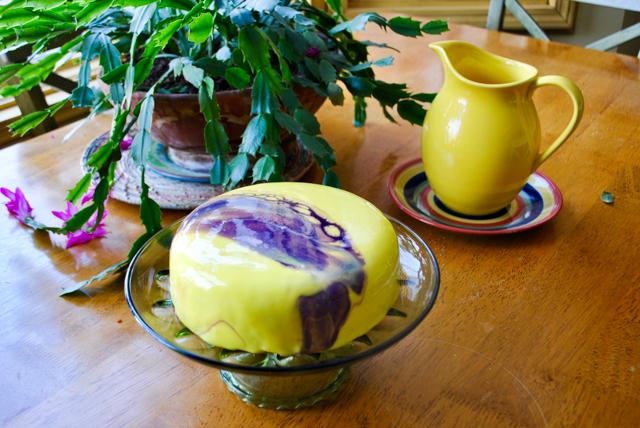 Add the puree inside a 7 inch cake ring lined with plastic wrap and placed over a baking sheet and freeze it. You can also use any other type of mold you like, as long as it is smaller than the Silikomart mold used to assemble the entremet later. Also keep in mind that you’ll need to easily un-mold the blueberry compote after it’s frozen solid, so choose your gadget carefully. You can leave it in the freezer for 3 hours or several days. When the compote is frozen, place a layer of genoise chocolate cake on top of it, press gently to form the final insert of the entremet. Place the gelatin sheets inside a bowl with cold water and leave it for 10 minutes. In a sauce pan, preferably non-stick, add the eggs, sugar and lemon juice. Cook stirring often over gently heat, until it thickens slightly . Aim at a temperature of 170 F, do not let it go higher than that, or you will scramble the eggs and ruin it completely. Remove from the heat, pass it through a sieve into a glass bowl. Once the temperature is below 175 F, add the gelatin and the pieces of cold butter. Mix gently. Put a plastic over the surface and allow it to cool to room temperature. Once it is almost cooled, beat the whipping cream to soft consistency. Add it to the lemon curd, folding it gently. Your mousse is ready to use. Place the gelatin sheets inside a bowl with cold water for 10 minutes as you prepare the other ingredients. In a sauce pan, heat the glucose, sugar and water until boiling. Make sure the sugar is fully dissolved. Let it cool slightly, and add to a bowl with the white chocolate in small pieces. After a few minutes, use a spatula to dissolve the chocolate. Add the gelatin and the condensed milk, and mix gently, try to avoid incorporating air bubbles. Add the titanium oxide and the yellow food dye. Place the mixture in a tall, plastic container and use an immersion blender to fully emulsify the glaze. At this point, you can either wait for it to cool to the pouring temperature (about 96 F), or place it in the fridge overnight, with plastic film touching the surface. In both cases, right before glazing the cake, pass the mixture through a fine sieve to burst any small bubbles that might interfere with the mirror effect. Heat the neutral glaze to 150 F. Add the purple color. Mix well. Keep hot until needed, with a hot spatula ready to go. FINAL ASSEMBLY: The dessert is assembled inverted, that is the top will be at the bottom of the Silikomart mold. Start by spreading about 1/3 of the lemon mousse inside the Universo mold. Make sure to use the back of a spoon to smooth the sides of the mousse all around, to avoid large bubbles to stay near the surface. Remove the blueberry-genoise insert from the freezer and place it gently over the mousse, with the cake facing up. Add a little more mousse all around the sides, then finish with the cookie layer. Use any leftover mousse to fill all gaps, press the cookie gently to make it leveled with the opening of the mold. Wrap it all in plastic and freeze at least 6 hours, preferably overnight. 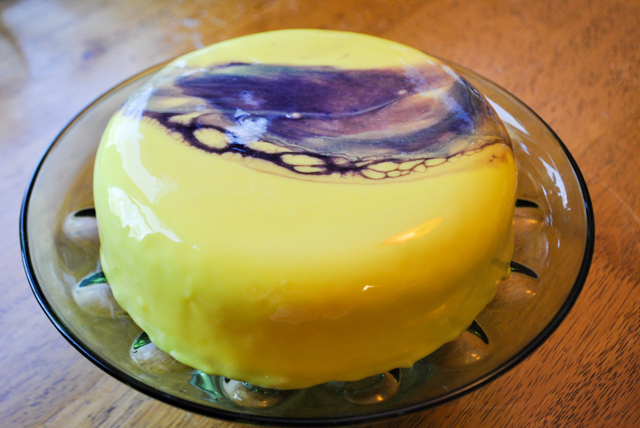 Have the yellow mirror glaze at 96 F, with bubbles removed by sieving. Have the purple neutral glaze ready at 150 F. Un-mold the frozen cake, place it elevated over a rack so that the glaze can freely drip from the sides. Smooth the surface with your hands, but work quickly to avoid condensation of water on the surface. 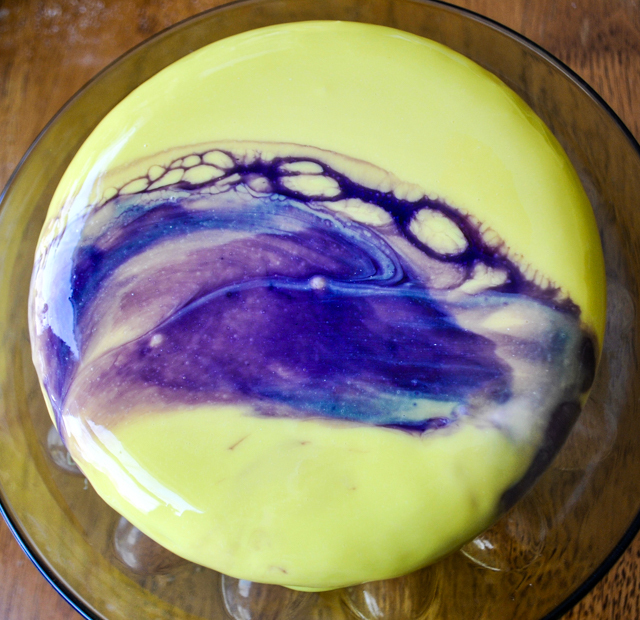 Pour the yellow glaze on a circular motion, making sure all cake is covered by glaze. Immediately grab some purple neutral glaze with the hot spatula and smear over the surface, preferably a little off-center. The effect will depend on many factors, including how much pressure you apply to the spatula, and the temperature differential between the two color glazes. Once the glaze stops dripping, you can use a knife to clean the bottom, and carefully move it to a serving platter. Defrost it in the fridge for at least 2 hours before serving. Use a hot knife to slice into pieces. Comments: This dessert was planned in a very unusual way. Instead of choosing cake or mousse flavors, I started with the colors of the glaze. I know, crazy! I wanted bright, contrasting colors in a spider-web style. Yellow and purple popped in my mind. Only then I decided on the flavors of lemon and blueberry. 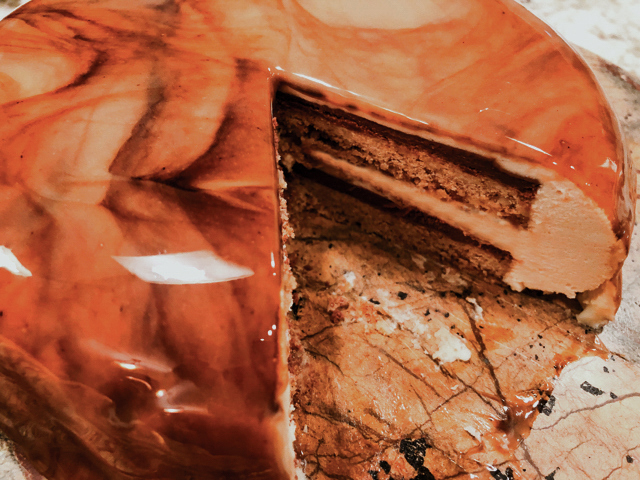 Entremets join several components of contrasting textures, but to simplify it I opted for a single element with a crunchy nature, the cookie base from this blog post by Miúda. To cut the sharpness of the lemon and add another type of texture, a chocolate genoise was included. Confession: I had it in the freezer from another baking project. 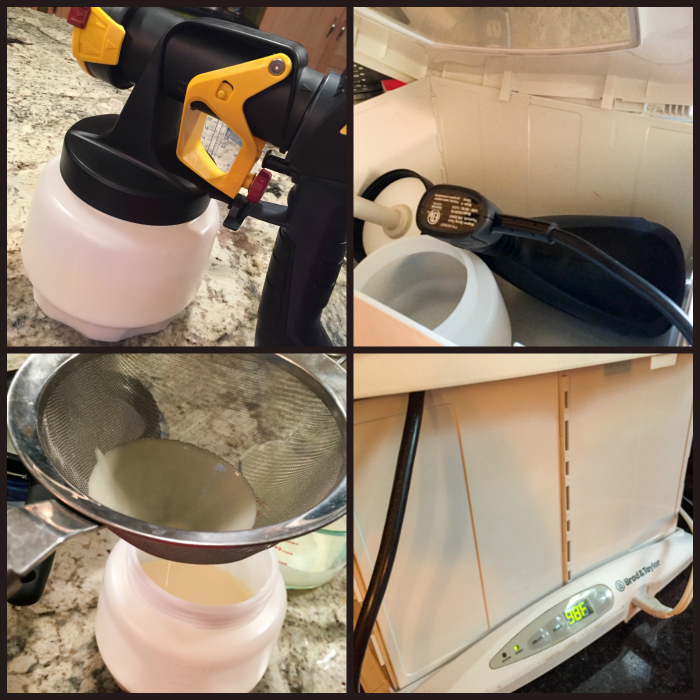 With those components in mind, I went to work, using some bits and pieces found online, and some general instructions from “The Pastry Chef’s Little Black Book “ which I highly recommend. It is a very extensive list of basic formulas and variations. If you want to come up with a mousse, a compote, a genoise, you can find all the do’s and don’ts in that book. The purple color became more “purple” once the glaze set. If you look at the composite picture, taken right after pouring, you’ll notice a more “brownish” color, which made me at first a bit hysterical worried. But it definitely changed as it cooled, and the real nature of the dye I used came through. Happy ending… always a nice thing. Here you see the slice showing the layers. The cake changed a bit by sitting in the fridge overnight. I added the glaze around 2pm, and cut a test-slice in the evening. At that point, the cookie base was very crunchy and the cake was more on the dry side. Genoises are usually moistened with some type of syrup, but since this was going to be surrounded by a mousse and a compote, I used it without any added moisture. Next morning I cut the cake to take to the department and it was considerably improved. The cookie base not as tough, very easy to cut through and with a more melt-in-your mouth characteristic. Similarly, the cake was more moist and tender. All in all, I’m very happy with this dessert. The lemon mousse component was the real winner. In fact, if you’d like to serve a mousse by itself, maybe with a small cookie as adornment, consider this exact lemon version. Very refreshing, bright in the palate, smooth and with the right amount of sweetness. Grab a pin before you leave…. When writing a scientific article, every method used in the experiments needs a reference that gives credit to the scientist who came up with the technique. A little fun trivia for you: one of the most cited papers in our field is a method to analyze proteins on a gel, called sodium dodecyl sulfate-polyacrylamide gel electrophoresis (SDS-PAGE). Every biochemist in the known universe uses that technique, and the original paper, published by Dr. Ulrich Laemmli in 1970 has been cited in literature more times than any other. If not yet bored and/or asleep, you can read about it here. And see what one of our own protein gels looks like with a click here. Each of the little dark bands is a unique protein, each vertical lane comes from a different bacterial culture. Bottom line is, giving credit where credit is due is always in a scientist’s mind. Perhaps for that reason I have a very tough time calling a recipe my own. Like the one I’m sharing today. Make the sablé cookie. Mix the flour, powdered sugar, ground almonds and salt. Add the cold butter, cut into cubes and work the mixture with your fingertips until it forms small crumbs. Add a lightly beaten yolk and almost the full tablespoon of ice water. Mix quickly until the dough is homogeneous. If needed, add the rest of the water. Form a flattened ball, wrap in plastic film and take to refrigerator for at least 30 minutes. 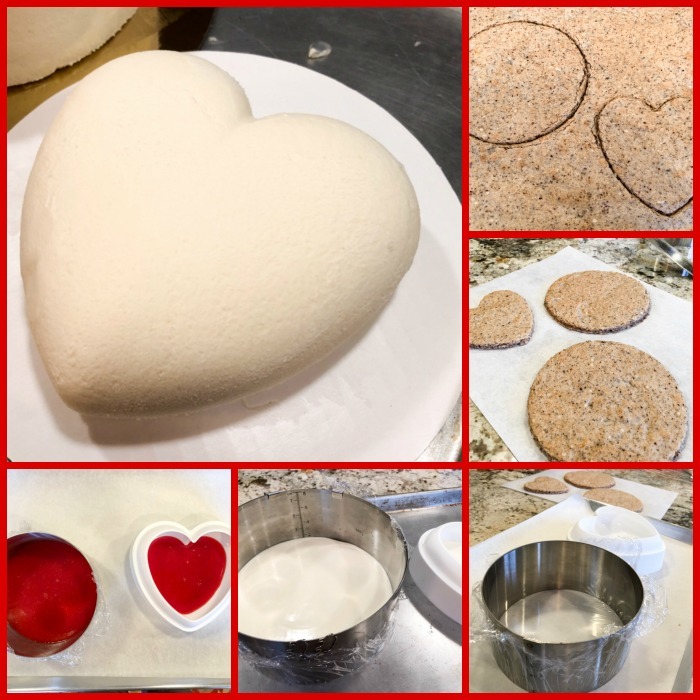 Then roll out the dough between two sheets of parchment forming a circle, and cut it with a cake ring the exact size of the mold you will use to form the dessert (aim for a circle of about 18 cm). Refrigerate the dough for several hours before baking in a 400 F oven until golden. Cookie base can be made a couple of days in advance. Make the pistachio mousse: bloom the gelatin in very cold water. In a bowl, add the yolk, the pistachio paste and the sugar. Stir well until you get a fluffy cream. In a pan, bring the milk to medium heat. When the temperature reaches about 160 F, remove the pan from the heat and pour, slowly, over the yolk mixture, stirring all the time. Return this whole mixture to the pan over medium heat, stirring constantly until the mixture thickens slightly (about 180 F). Remove from heat and pass through a sieve. Add the bloomed gelatin, and stir well. Let it cool to about 113 F and carefully add the whipped cream. Fold gently. Make the apple-yuzu insert. Peel and dice the apples into 5 mm cubes. Combine the sugar and pectin in a small bowl and transfer to a saucepan. Add the yuzu or lemon juice to the saucepan and mix everything together. Turn the heat on to medium, add the apples and the vanilla. Cook very very gently with the lid on for 10 to 15 minutes or until the apples get translucent and start to melt down a bit. You will need to stir it often, so that the fruit does not burn at the bottom. Make sure the flame is really low for the whole cooking time. Freeze inside the mold you will use to assemble the dessert (you will un-mold it and save it for later). The apple compote needs to be made two full days before you need to assemble the dessert, as it needs to be frozen solid. Make the caramel mousse. In a small bowl, mix gelatine and water (25 ml) together and leave for 5 to 10 minutes to bloom. Meanwhile, in a sauce pan, mix together sugar, glucose (or corn syrup), water (35 ml) and salt. Cook on medium high heat until you achieve a caramel syrup with deep amber color. Do not allow it to smoke or burn. 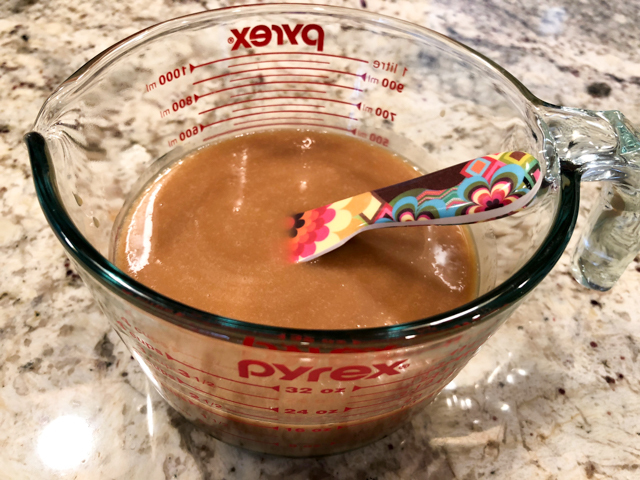 Meanwhile, in another sauce pan, slightly the heat the 100 grams heavy cream, so when the caramel is ready you can pour the cream right away. Carefully pour it in and mix well until fully combined. In another bowl, whisk the egg yolk. Then add a third of the caramel to the beaten yolk and whisk quickly together to temper. Pour the mixture back into the caramel and stir well to combine. Continue stirring until it reaches 180-182 °F. While still hot, add the bloomed gelatin, and mix into the caramel cream. Pass the cream through a fine mesh strainer, and set it aside to cool to 113 F. When cooled, whisk the remaining heavy cream (190 g) into a stable, yet soft consistency (like yogurt). Then fold it in two additions into the caramel cream, until well combined. Assemble the dessert. 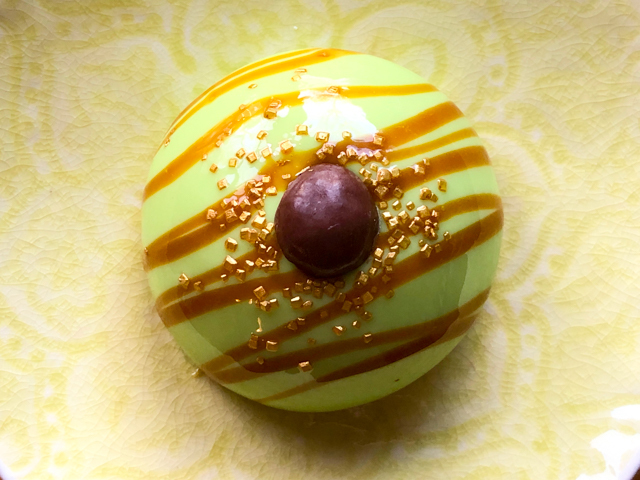 At the bottom of the Universo mold or cake ring wrapped in plastic film, pour the pistachio mousse. Place the frozen yuzu-apple insert in the center, pressing it lightly. The mousse will cover the insert, but not fill the mold completely. Place the mold in the freezer and proceed to make the second mousse. 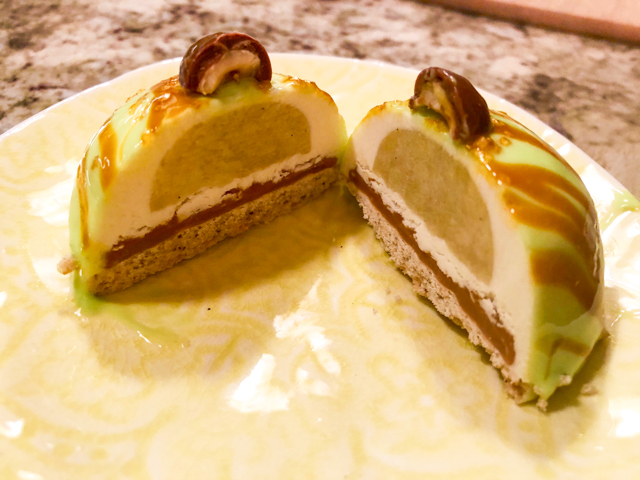 Pour the caramel mousse in the mold covering it almost to the top, and carefully close it all with the sable cookie. Make sure it is all well-leveled. Freeze overnight. Un-mold the dessert right before glazing. Make the mirror glaze. Bloom the gelatin by mixing it with 55 ml water in a small bowl. Reserve. In a small sauce pan, combine the second amount of water with sugar and glucose, bring to a boil, making sure sugar is fully dissolved. Place the white chocolate cut in small pieces in a large bowl. Pour the boiling sugar-glucose mixture over it, stir to combine, add the condensed milk and emulsify it all very well with an immersion blender. Add the titanium oxide. Divide the glaze in three amounts, leave one white. Color the other two with dark brown gel color and caramel gel color, respectively. Mix each one completely (preferably with immersion blender), but avoid incorporating any air in the mixture. Pass the mixtures through a sieve to burst any bubbles. When the temperature cools to about 96 F pour the three colors together in a single container, a little bit of each, alternating the colors. Glaze the frozen cake forming any type of pattern you like. Keep the cake in the fridge for a couple of hours before serving. Use a knife with a hot blade for better slicing. Comments: This recipe was designed around its apple center. Remember my little dome cakes from last month? I had quite a few of those little inserts of apple compote in the freezer, so I brought them to room temperature and re-froze in the Universo mold to be part of this new dessert. With that main component in mind, I searched for mousses that would complement it well. Not too long ago the amazing Miúda from the blog verdadedesabor made a pistachio mousse that left me dreaming. So I incorporated it. 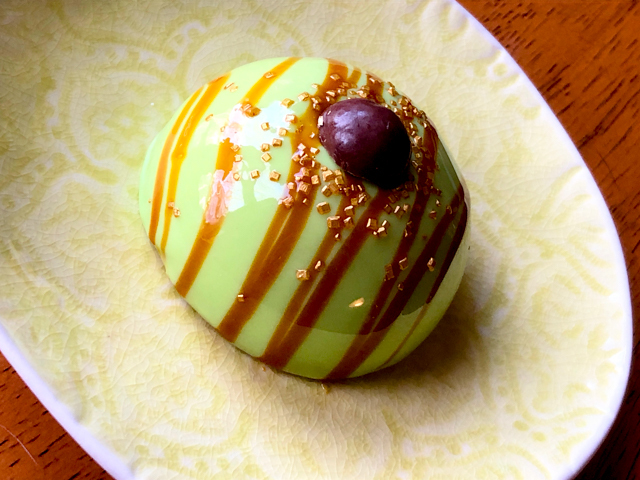 To add another flavor component, I re-visited a caramel mousse I made in the past and loved. Apple, pistachios and caramel sounded pretty good together. The sablé is my favorite type of cookie to use as a base because it is sturdy, tasty, and does not change shape during baking. I cut the cookie in the exact size of the mold, so it sealed it perfectly for freezing and made un-molding the dessert quite easy. Remember, measure twice and cut once. The yuzu-apple insert. As I mentioned, I used leftover compote from a previous adventure. It is a bit tricky to judge how much compote you would need, so I halved the previous recipe and imagine it will be pretty close. All you need is to form a layer with a thickness of about 3/4 inch to place inside the mold. 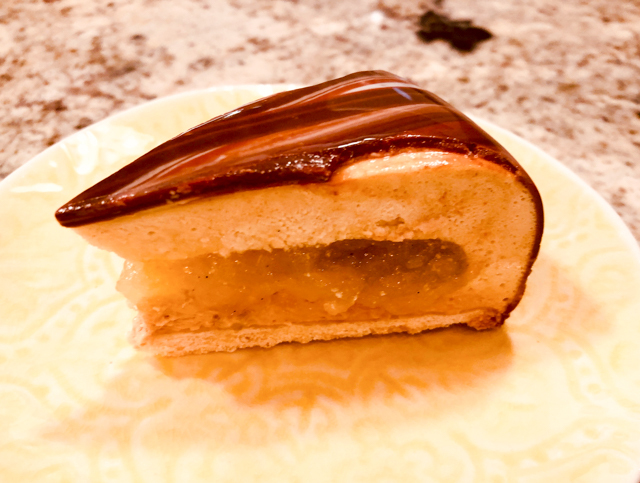 The cake turned out delicious, I think the only issue was the re-melting and re-freezing of the compote, it was slightly less firm than in the original mousse cakes made before. I am not sure if it would have been better to reduce it a little or even add a bit more pectin before re-freezing, but my advice is to freeze it on the exact shape you intend to use. Mission Mondays with Sweetness accomplished! ONE YEAR AGO: Someone turns 70 today! FIVE YEARS AGO: Bran Muffins, Rainbows, and a wonderful surprise! I absolutely adore individual dome cakes. They are small, cute, and if you gild the lily with a mirror-glaze, they have the potential to seriously awe your guests. For this version, I paired two classic flavors, apple and caramel, but the caramel was perfumed with sobacha tea. 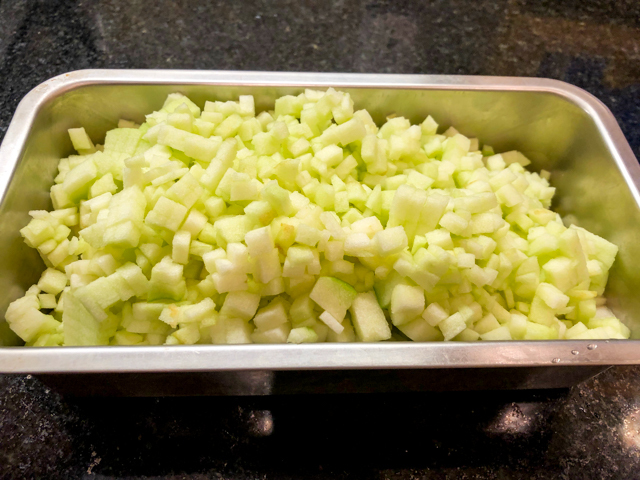 As I mentioned not too long ago, I am (still) in a Japanese-ingredient obsessive mode, which explains why sobacha made its way into our kitchen. I have to share another little obsession with you: online classes from Savour.com, an Australian website that is simply amazing. My favorite instructor is Kirsten Tibballs, but they have classes by other chefs, all worth every minute of your spare time. 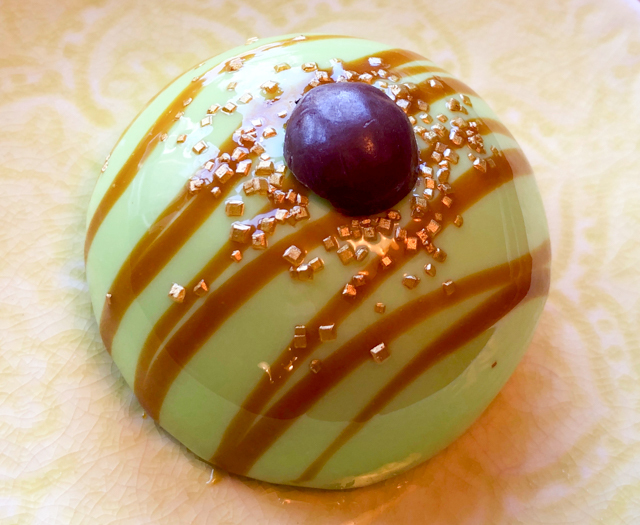 The sobacha caramel was an idea from Chef Jerome Landrieu, another instructor from Savour. I paired that with an apple compote, and a white chocolate mousse. All sitting together over a hazelnut sable cookie. The fun can be spread over three days. On the first day, make the cookies and the apple-yuzu insert. On the second day, make the sobacha-caramel, the white chocolate mousse, assemble the cakes and freeze them. On the third day, make the mirror glaze and coat the cakes. Keep them in the fridge for at least one hour before serving. Make the sable cookies. Add the butter and the hazelnut flour into a food processor. Process a few times until the mixture looks like sand. Add the rest of the dry ingredients, pulse a few times. Do not over-process to the point it will come together as a dough. Now add the egg (beat one egg and add the exact weight called for in the recipe). Pulse the processor two or three times, stop immediately and finish the dough by hand. You want to bring the dough together without over-working because now that liquid was added (through the egg), working the dough too much will develop gluten. Roll the dough quickly on a lightly floured surface to cover more or less the extension of a quarter-sheet baking pan, the thickness should be around 3mm. Place the rolled dough in the fridge for about one hour, then cut circles of the exact diameter of the dome pan you will use for the cakes. This dough won’t spread or shrink, so you can exercise precision. Place the cookies on a baking sheet (perforated, if available), and bake at 350 F for about 12 minutes. They do not need to develop color, just fully bake. Reserve. Make the apple-yuzu insert. Peel and dice the apples into 5 mm cubes. Combine the sugar and pectin in a small bowl and transfer to a saucepan. Add the yuzu or lemon juice to the saucepan and mix everything together. Turn the heat on to medium, add the apples and the vanilla. Cook very very gently with the lid on for 10 to 15 minutes or until the apples get translucent and start to melt down a bit. You will need to stir it often, so that the fruit does not burn at the bottom. Make sure the flame is really low for the whole cooking time. Place portions in a small mold that will work as an insert for the dome cake. You can alternatively spread the compote as a thick layer and cut small rounds to use as insert after it is frozen. Freeze the molds containing the apple mixture for a few hours or overnight. Make the sobacha-caramel. Infuse the heavy cream with sobacha tea by bringing the heavy cream to almost a full boil and adding the tea. Turn the heat off, cover the pan and let it sit for 10 minutes. Drain the tea away, weigh the heavy cream and complete with fresh cream to restore the full 120g (some of it will be lost when the tea is sieved). Combine the maple syrup, sugar, sobacha-cream, milk, corn syrup, and salt in a saucepan. Stir over medium heat until the mixture reaches 240 F (115 C). Remove from the heat and stir in the butter. Let it cool until it has spreadable consistency. 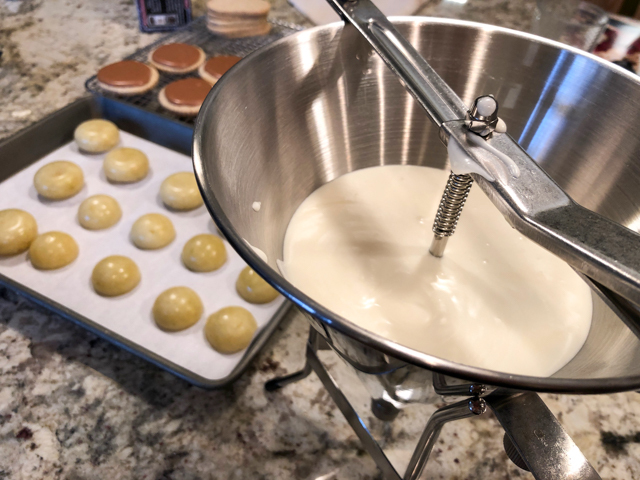 You can place it in a piping bag (no piping tip needed) or use a small spatula to spread a very thin layer over the sable cookies that will be the base of the dome cake. Reserve in the fridge until ready to assemble the dessert. 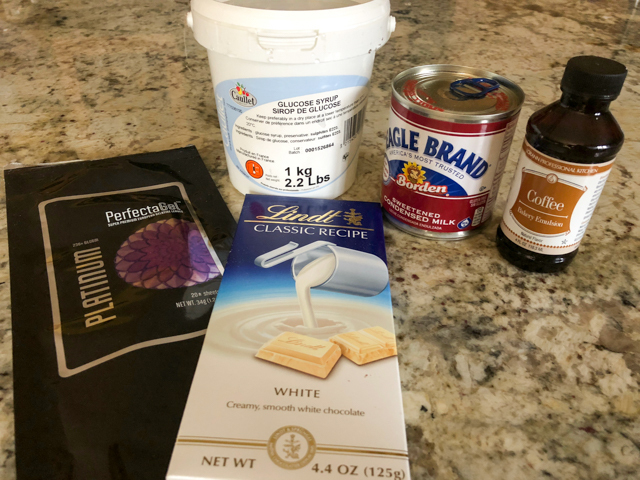 Make the white chocolate mousse. Mix the gelatin with water and allow it to sit at room temperature for 10 minutes. Heat 175 g of heavy cream in a saucepan until bubbles appear around the edges. Pour over the white chocolate, add the bloomed gelatin, stir gently until chocolate is dissolved. Add the lemon juice and reserve. Whip the remaining 200 g of heavy cream (very cold from the fridge) until it reaches the consistency of melted ice cream. Fold gently into the reserved white chocolate mixture. Assemble the dessert. Add a bit of mousse to the bottom of the large half-sphere mold. Place a frozen apple-yuzu insert on top, don’t press too hard, so that it won’t show on the surface. 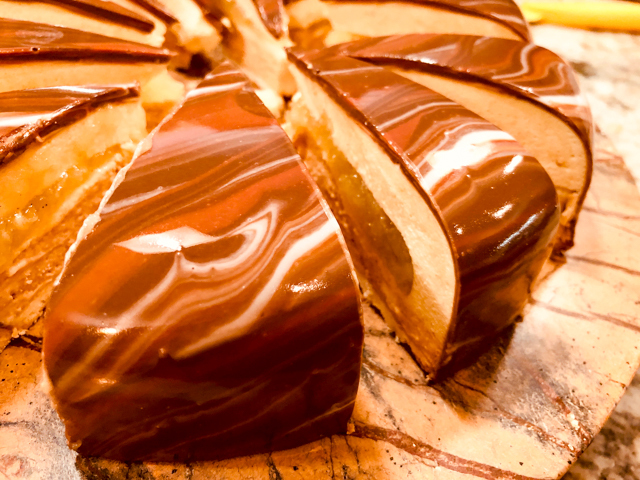 Fill almost to the top with mousse, then place the caramel-coated sable floating on top, with the caramel side down. Flatten everything well, if needed add additional mousse on the edges. Freeze overnight. Make the mirror glaze. Put the water, sugar and liquid glucose in a small pan and bring to simmering point, stirring occasionally to dissolve the sugar. Remove from the heat and let it stand for about 5 minutes. This is the base syrup for the glaze. Meanwhile, soak the gelatin in some cold water for about 15 minutes. Squeeze out the excess water and stir into the hot water, sugar and liquid glucose mixture to dissolve. Stir in the condensed milk. Put the chocolate in a medium bowl and pour this hot mixture slowly over the chocolate, stirring gently to melt it, avoid making bubbles. A stick immersion blender works great, but you must keep the blades fully submerged at all times. If bubbles are present, pass the mixture through a fine sieve. Add 1/2 tsp titanium oxide to the mixture, divide in two portions, one very large, one about 1/3 cup. Color the large amount light green, trying to mimic the color of a Granny Smith apple. Start with 3:1 yellow to green and adjust as you mix. Color the smaller amount with a caramel tone, and place in a squirt bottle. Reserve both until they reach pourable temperature. The ideal temperature to pour the glaze is 92 to 94 F. Once they reach that temperature, remove the cakes from the freezer, un-mold them and set them over a rack placed on top of a baking sheet. Glaze them with the light green mirror glaze, then make a drizzle with the caramel color. If you want, add sprinkles and a chocolate-covered hazelnut on top. Keep in the fridge for at least one hour up to overnight before serving. Comments: I guess this is the longest recipe I’ve ever published, I am a bit tired just from reading it… The secret of this type of dessert that sounds like a culinary marathon, is dividing the work in several days. Once you do that, you wont’ feel overwhelmed at all. The toughest part of this recipe was dicing the apple, but it becomes a bit of a Zen thing. And when you look at the pieces later, it looks incredibly cool. Yuzu juice. Tough to find, this time I had to resort to amazon, but if you live in a place with a well-stocked Japanese section, you might be able to get some. If you don’t have it, second best option would be Meyer lemon, or go for a mixture of lemon and lime juice (1:1) and call it a day. The yuzu adds a very intriguing citric flavor, so I advise you to try it at least once. As you can see from the first composite picture, I had two different sizes of molds for the inserts. The white one is a Silikomart “Stone”, and it ended up too big for the spheres I chose. Looking at the final dessert, I think that I could have made the insert even smaller, so that it would have more mousse. It’s a tough call. Phil liked it just the way it was. Isn’t it a thing of pure beauty and functionality? It has three different sizes of opening at the bottom, I used the largest one for this job. They can be twisted on and off, and stored on the handle. I will showcase it better in my next In My Kitchen post. Stay tuned. 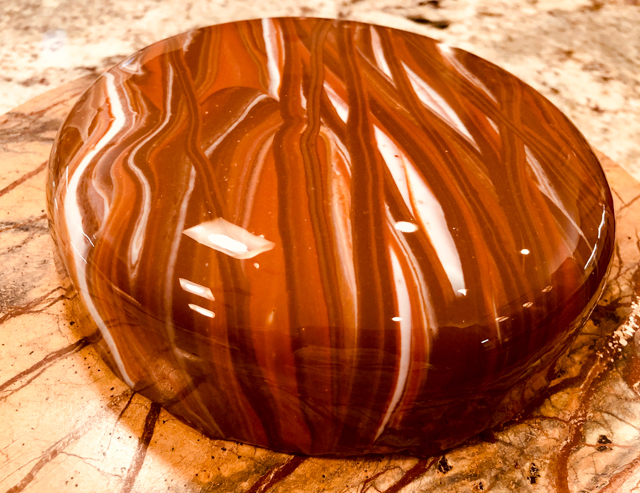 Mirror glaze: The dome cakes un-molded perfectly and had a very smooth surface. The most important thing is to coat them right away, to prevent condensation to form as they sit at room temperature. Pour from the top in a circular movement, and make sure you do a 360 degrees check, because sometimes small bits at the bottom might not get covered. There is some room for tweaking and the amount of glaze I shared is more than enough to cover six to eight cakes. So here it is, my baby-dome cake sliced in half so you can see inside. I have a hard time deciding if the size of the insert is good as it is, or smaller would be better. The caramel layer is very sweet so a thin layer is all that you’ll need. The apple-yuzu compote stole the show… As you can see from the first composite picture, it made quite a few. In fact, I halved the recipe to share in this post, because it made so much. I have some ideas to use it in the future, will de-frost them and freeze again in a different size and shape for a future entremet type cake. For the time being, they are hibernating in the freezer, together with leftover mirror glaze. Best friends forever. 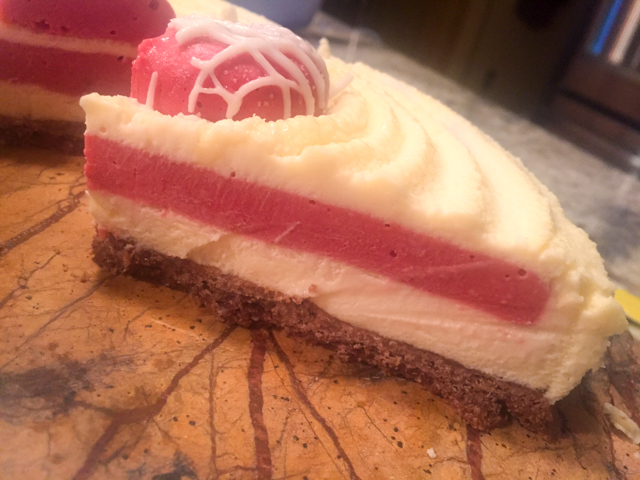 I hope you enjoyed this long post, and perhaps consider venturing in the world of mousse cakes. 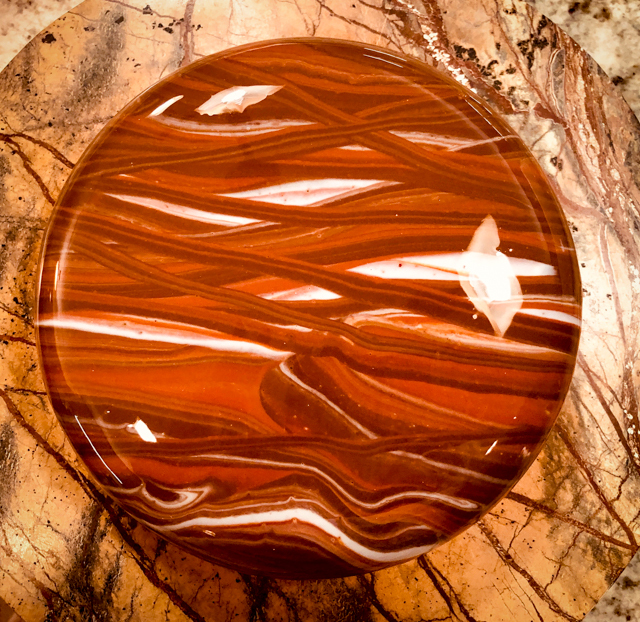 It is a lot of fun, the thrill of coating a cake with mirror glaze never seems to get old. I think it’s as addictive as baking macarons! If you are obsessed with mirror glazed cakes, perhaps you’ve heard of the absolute goddess of the mirror universe, Ksenia Penkina. The stuff she does is purely mind-blowing. Ksenia offers classes online and for a long time I dreamed about taking one. I finally caved and got her introductory class, in which she explained how to make this adorable mousse cake. Having changed quite a few things in the recipe, (cake base, insert and glaze), I feel it’s ok to share. Plus, it would be impossible to offer in a blog post everything you get from watching her. Running no risk of infringing any copyright issues, I show you two versions of the same mousse cake, a larger one in a traditional format, and a small cake that would be perfect for a Valentine’s Day dessert. They were both made to celebrate Aritri’s PhD defense in November, a wonderful accomplishment by our most amazing graduate student. Congratulations, Dr. Majumdar! Prepare a 7 inch cake ring by wrapping it in plastic from the bottom to the sides, so you can use it to pour the fruit insert and freeze it later. Make sure it is sitting on a flat baking sheet that will fit in your freezer. Make the dacquoise base: in a bowl, mix together the flour, powdered sugar, and ground hazelnuts. Reserve. Make a meringue by whisking the egg whites with the cream of tartar until very foamy. Add the sugar slowly, whisking in high-speed until soft peaks form. Delicately fold the dry ingredients into the meringue. Spread as homogeneously as possible in a baking sheet to have a thickness of about 0.4 inch (1 cm). Bake for 15 to 20 minutes. Cool it completely and store in the fridge until ready to assemble the cake. Make the raspberry insert: In a small bowl, add the cold water, then pour the gelatin powder on the surface, gently mixing to hydrate the powder. Let it sit at room temperature for 10 minutes. Sift the sugar with the cornstarch and add to the puree of raspberries in a saucepan. Bring to a boil, stirring constantly. Turn the heat off, allow the mixture to cool to around 175 F (80 C), and add the bloomed gelatin, whisking well to fully incorporate it into the hot liquid. Pour some of it in the prepared cake ring to a depth of 1/2 to 3/4 inch. If using the heart-shaped mold, pour an amount to give similar thickness into that pan too. You will use the full amount made to divide in the two pans. Freeze for several hours, or preferably overnight. Make the white chocolate mousse: mix the gelatin with water as described for raspberry insert. Reserve. Heat 350 g of heavy cream in a saucepan until bubbles appear around the edges. Pour over the white chocolate, add the bloomed gelatin, stir gently until chocolate is dissolved. Warm the lemon juice briefly in the microwave, and pour over the white chocolate cream. Reserve. Whip the remaining 400 g of heavy cream until it reaches the consistency of melted ice cream. Fold gently into the reserved white chocolate mixture. Your mousse is done. 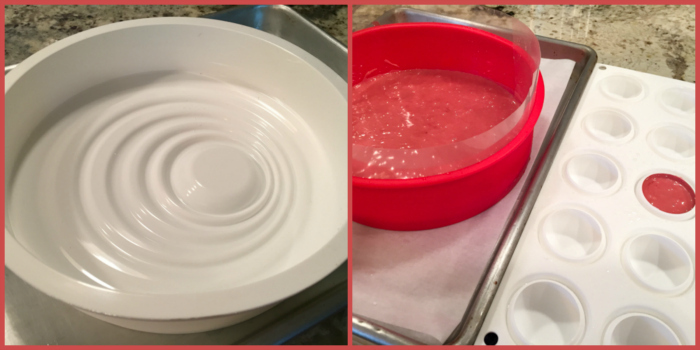 Assemble the cake: remove the pans with the frozen inserts from the freezer and remove them from the molds. Prepare a slightly larger cake ring (8 inch) with plastic wrap in the bottom to assemble the larger cake. Add to the bottom of each pan (cake ring and heart-shaped mold) a layer of white chocolate mousse. Carefully place each insert floating on top, trying to center them as well as possible. Cover the mold almost to the top with mousse, then add the reserved dacquoise on top. Fill and gaps on the sides with mousse to make a smooth top (which will be the bottom of your un-molded dessert). Freeze overnight. Really important that the cake is absolutely frozen before proceeding with the glaze. Make the mirror glaze. Put the water, sugar and liquid glucose in a small pan and bring to simmering point, stirring occasionally to dissolve the sugar. Remove from the heat and let it stand for about 5 minutes. This is the base syrup for the glaze. Meanwhile, soak the gelatin in some cold water for about 5 minutes. Squeeze out the excess water and stir into the hot water, sugar and liquid glucose mixture to dissolve. Stir in the condensed milk. Put the chocolate in a medium bowl and pour this hot mixture slowly over the chocolate, stirring gently to melt it, avoid making bubbles. A stick immersion blender works great, but you must keep the blades fully submerged at all times. If bubbles are present, pass the mixture through a fine sieve. Add 1/2 tsp titanium oxide to the mixture, divide in two portions. You are aiming for two different tones of red. I used red and a tiny amount of black dye for the darker color, red, pink and white to the second portion. 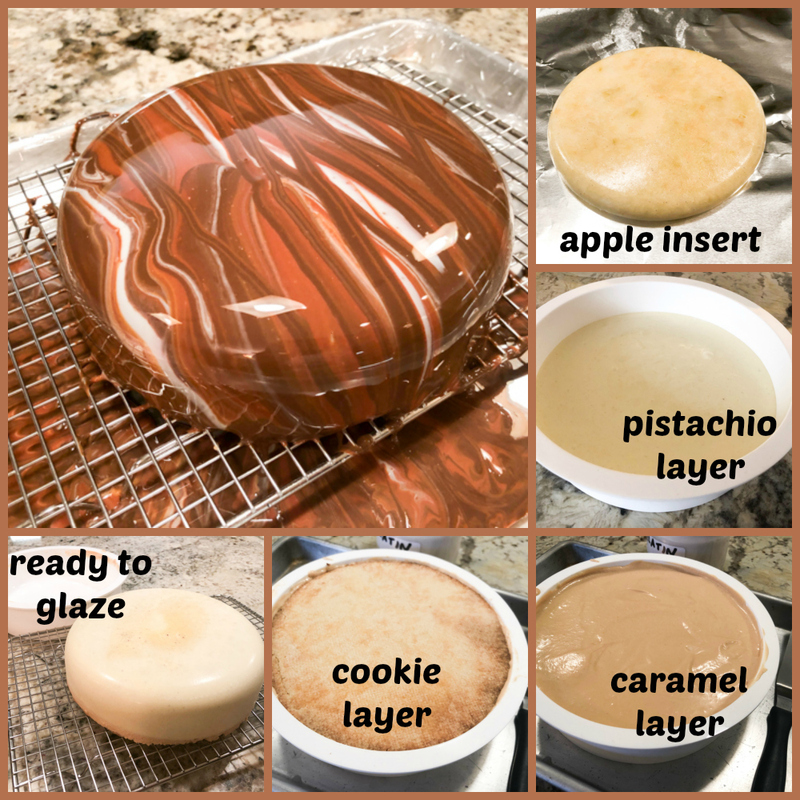 Leave the glaze uncovered for an hour at room temperature for the glaze to cooled and be slightly thickened: if it is too runny you will get too thin a layer on top, colors will not blend well and less glaze will cling to the sides of the cake. 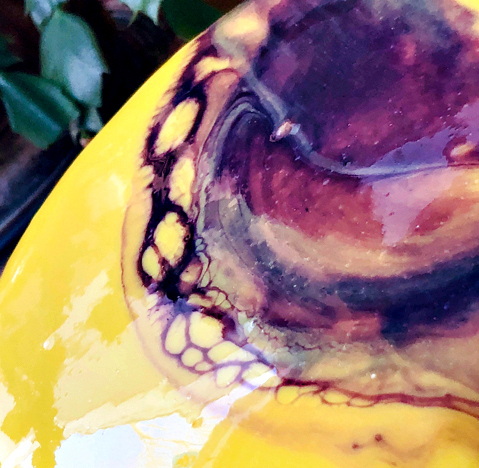 The ideal temperature to pour the glaze is 92 to 94 F. Once it is slightly above that (around 97 F), pour both colors in the same container, barely mix them, and pour over the frozen, un-molded cakes sitting over a rack with a baking sheet underneath. Tap the rack gently to settle the glaze, and very gently and quickly run an off-set spatula on top of the cake to force excess glaze to run down the sides. Do that just once, or you will ruin the marble effect. Drips under the cake can be cleaned with a spatula or sharp knife. Let the glaze set at room temperature for 15 minutes, add the decorations of choice, then place the cakes in the fridge for 2 to 3 hours. Use a hot knife to cut slices without compromising the glaze. Comments: The recipe will make two cakes, you can definitely cut it in half and bake a single large cake or a couple of small ones. I used a Silikomart mold called Amore for the small cake, and a cake ring, 8 inch diameter for the large one. The original cake base was a coconut dacquoise, but Aritri is not too wild about coconut in desserts, so I used a hazelnut version instead. Ksenia has access to a different type of gelatin, hard to find in the US, so I decided to stick to the mirror glaze formula from Philip’s blog, as I’ve been doing lately. 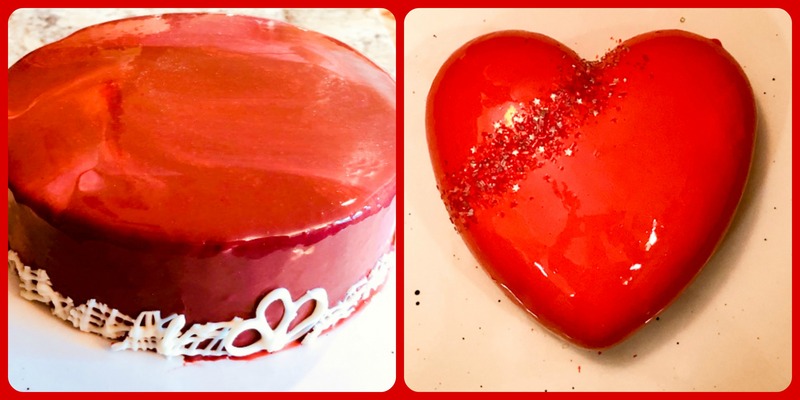 The larger cake was glazed a few hours before the heart cake, so I could only do the two-color effect on the big one. The leftover glaze was saved and applied to the small cake, but then the colors were obviously mixed. To add a bit more of a festive look, I used decorations from Fancy Sprinkles, a company I advise you to visit with restraint. Dangerous, very dangerous site. You’ve been warned. To decorate the larger cake, I sat in front of a candle in a comfortable Full Lotus posture (yeah, right), went through 113 cycles of deep breathing, and… tried my hands at tempering some white chocolate. Against all odds, it was successful. Once I was done with my extended version of the Ecstatic Dance, I piped random crisscrossed lines on acetate film, let them set, broke them into small pieces and attached them to the base of the cake. In retrospect, I should have planned the decorations more carefully to come up with something a little more elegant. But truth be told, tempering chocolate is so tricky for me, I never expect it to work. When I realized it was all good, I had no specific plan on how to use it. Oh, well. Next time I’ll be ready. And then we all know what might happen: both chocolate and me will lose temper. Story of my life. The cake tasted pretty amazing. I do think the combination of raspberries with white chocolate is hard to beat. Raspberries shine in desserts because they have such tangy flavor, cutting through excessive sweetness. 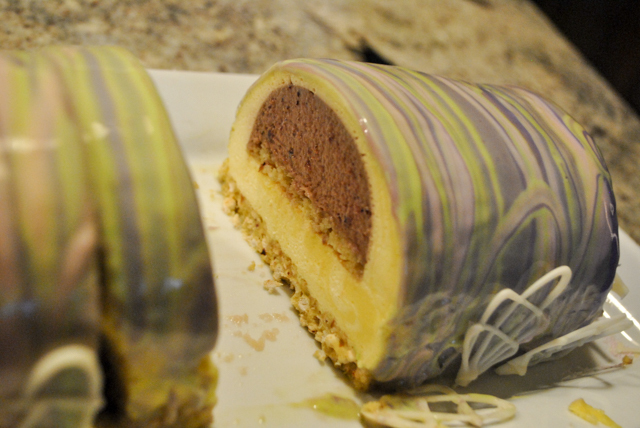 The hazelnut dacquoise retained its nice texture during the freezing-thawing process, it did not turn mushy at all. I need to fine tune the amount of gelatin in the glaze, though. It seems a tad too runny. One of the tricky parts of this type of dessert is baking a very uniform layer of cake or biscuit base. For cookie type bases (sable for instance), you can roll the dough using plastic guides with specific dimension. 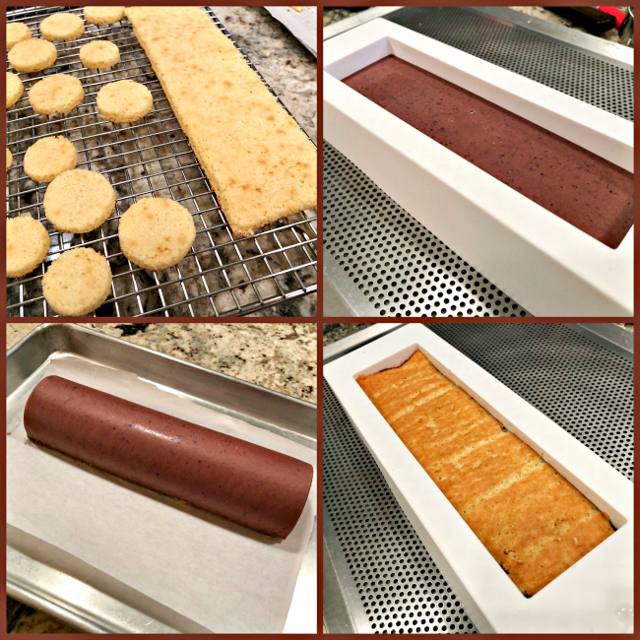 For cakes like dacquoise or genoise, I think baking frames could be the best option. Must investigate. 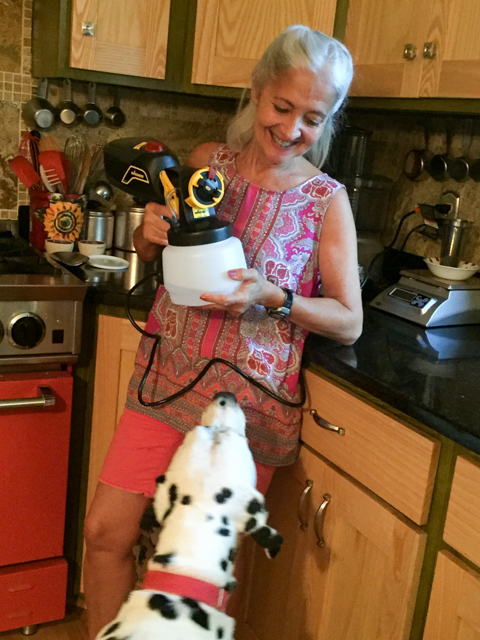 Could be a fun gadget to showcase in a future “In My Kitchen.” The sacrifices one makes in the name of blogging! 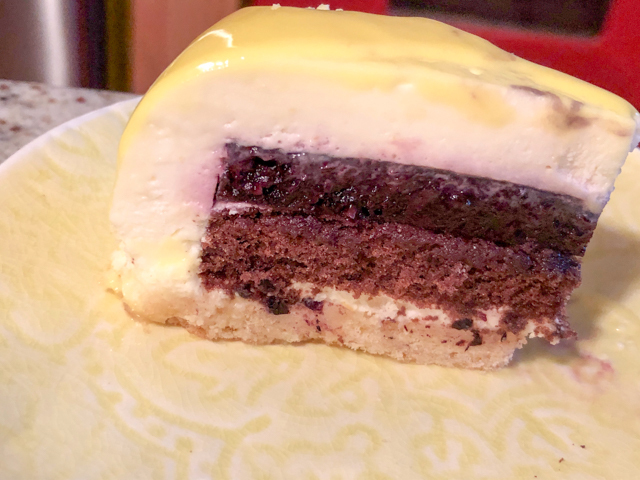 As far as mousse cakes are concerned, this is a reasonably simple one, because it involves a single mousse, a single insert, and a single layer of cake/biscuit. 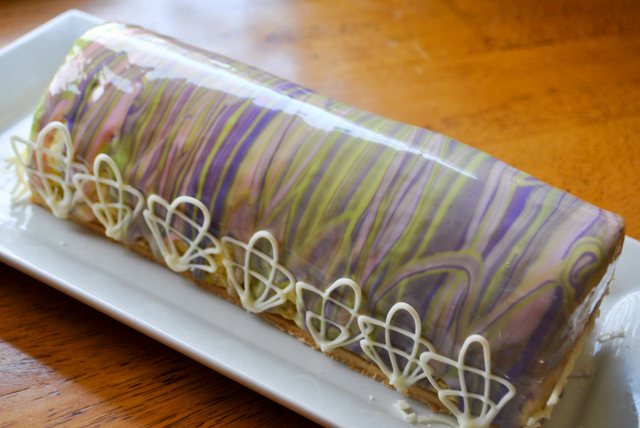 If you are worried about making a mirror glaze, the cake could be served “naked” with some simple decorations on top. 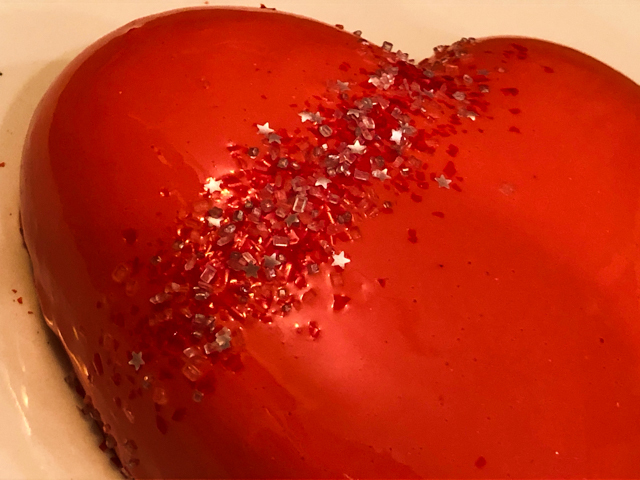 A drizzle of milk and white chocolate, a drizzle of white chocolate with some red dye dissolved in it, sprinkles, shaving of tempered chocolate, so many things you can do. But between you and me, the mirror glaze just makes a simple cake super special. Perfect to celebrate a terrific PhD defense! ONE YEAR AGO: Panettone Time! I don’t know what happened to the cake-o-phobe that used to live inside me. Creaming sugar with butter was a phrase that inflicted pure terror. Genoise-baking and torture seemed like stuff cut from the same cloth. Nowadays, there is nothing I enjoy more than baking entremet type cakes, which can be a bit intimidating. So many things can go wrong, and often do, especially when you are trying to learn by yourself, with the help of cookbooks, videos, and great virtual friends with endless patience (thank you, you know who you are). 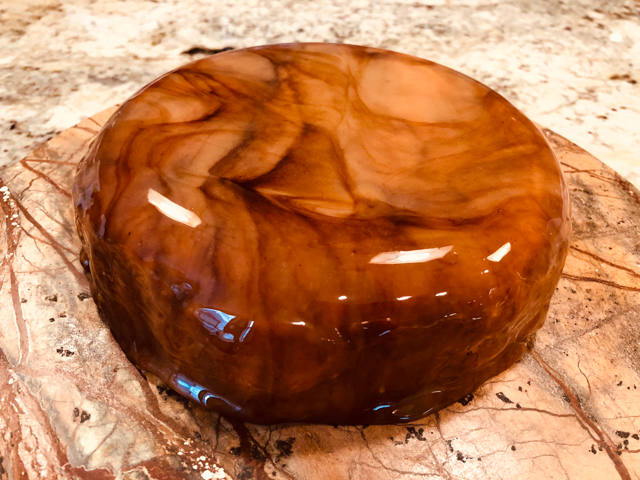 My most recent adventure coupled entremet and mirror glaze. Mirror mirror on the wall? No, thanks. I’d rather have it on the cake! Make the sable biscuit component. Heat oven to 350 °F and line a baking pan with parchment paper. In your stand mixer with beater attachment, beat together butter, sugar, salt and instant coffee. Mix until smooth. Add yolk and mix until combined. Then add flour, ground hazelnut and baking powder. mix until just incorporated. Divide the dough roughly in two pieces and roll each into a 3mm thick layer that you will cut as a circle, 5.5 inches in diameter. Transfer the dough to a baking dish lined with parchment paper and bake for 10 to 15 minutes. While still warm, cut two 5.5 inch circles. Set the circles aside. Enjoy the trimmings, or save them for other uses (great crumbled on yogurt). Chop the chocolate into small pieces and place in a bowl. Warm the cream in a small saucepan, until bubbles appear on edge of the surface. Pour over the chocolate, and let sit for 5 minutes. Combine the honey and butter and heat in the microwave until just melted. Mix to combine and set aside. Using a spatula, mix the chocolate in circular motion, then, add the melted butter and honey and mix to combine. Let the ganache cool to room temperature until it’s quite thick, then add a layer to each reserved sable cookie. Refrigerate for 2 hours minimum. In another bowl, whisk the egg yolks. Then add a third of the caramel to the beaten yolks and beat quickly together to temper the yolks. Pour the mixture back into the caramel and stir well to combine. Continue stirring until it reaches 180-182 °F. Heat the gelatine in the microwave for 20 seconds until melted (do not boil it, if needed reduce the power of your microwave to 70% or so) and mix into the caramel cream. Pass the cream through a fine mesh strainer, and set it aside to cool to 113 F (about 45 C). When cooled, whisk the remaining heavy cream (375 g) into a stable, yet soft consistency (like yogurt). Then fold it in two additions into the caramel cream, until well combined. Assembling the cake. 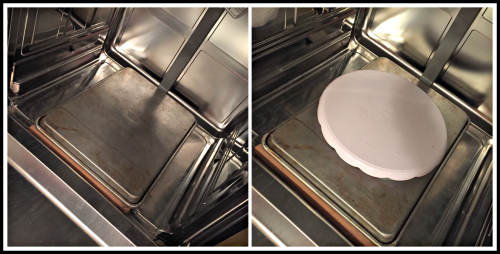 Set the bottom part of your Silikomart mold (white part) on a baking dish that will fit in your freezer. Pour a third of the mousse into the Silikomart mold and tap it on the table to level the surface and destroy large air bubbles. Carefully insert one of the cookies right in the middle, with chocolate side facing down. Add the upper part of your Silikomart mold and make sure it’s locked in place. Add the rest of the mousse on top of that, but reserve some to fill in the sides and top. Place the second cookie, chocolate side down on the top and pipe the remaining mousse around the edges. Use a small spatula to secure the cream on top. Freeze overnight. Make the mirror glaze. Put the water, sugar and liquid glucose in a small pan and bring to simmering point, stirring occasionally to dissolve the sugar. Remove from the heat and let it stand for about 5 minutes. This is the base syrup for the glaze. Meanwhile, soak the gelatine in some cold water for about 5 minutes. Squeeze out the excess water and stir into the hot water, sugar and liquid glucose mixture to dissolve. Stir in the condensed milk and the coffee extract. Put the chocolate in a medium bowl and pour this hot mixture slowly over the chocolate, stirring gently to melt it, avoid making bubbles. A stick immersion blender works great, but you must keep the blades fully submerged at all times. If bubbles are present, pass the mixture through a fine sieve. Leave the glaze uncovered for an hour at room temperature for the glaze to cooled and be slightly thickened: if it is too runny you will get too thin a layer on top, colours will not blend well and less glaze will cling to the sides of the cake. 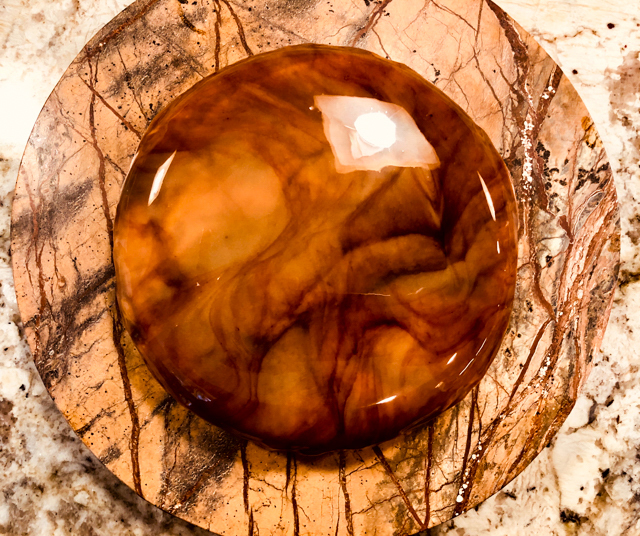 The ideal temperature to pour the glaze is 92 to 94 F. Once it is slightly above that (around 97 F), remove a small portion and add dark brown gel color to it, mixing well. Pour the un-dyed portion in a large measuring glass with a spout, add the dark brown mixture to it, mix with a chopstick just barely. Make sure it is at the correct pouring temperature. Remove the cake from the freezer, place on a rack over a baking sheet. If you like to make it easier to save leftover glaze, cover the baking sheet with plastic wrap, so that you can lift it and pour easily into a container. Take a deep breath, and pour the glaze in a circular motion, starting at the center, making sure it flows homogeneously on all sides. Tap the rack gently to settle the glaze, and very gently and quickly run an off-set spatula on top of the cake to force excess glaze to run down the sides. Do that just once, or you will ruin the marble effect. Drips under the cake can be cleaned with a spatula or sharp knife. Let the glaze set at room temperature for 15 minutes, then place the glazed cake in the fridge for 2 to 3 hours. Use a hot knife to cut slices without compromising the glaze. Leftover glaze can be frozen and re-used. The colors will obviously mix together, so you wont’ be able to repeat a similar marble pattern. Comments: At the risk of getting some serious hate mail, I must tell you that entremets seem a lot harder to make than they are. Can you bake a cookie? Can you make a mousse? Well, that’s all you need to make this entremet in particular. The components are simple, most can be made in advance, then it’s just a matter of putting it all together, paying attention to a few details. Let’s talk cookie base: In her recipe, Keren baked a single round sable cookie and sliced it in the middle, to form two layers. That in itself proves that she is a much MUCH more skilled baker than I am. That was simply not happening in the Bewitching Kitchen. Between you and me, confession: I did try it. It was a disaster, and I had to start all over and use a more straightforward method, baking two independent sables. When I do it again, I will make the cookies slightly thinner, for a cake with a higher proportion of mousse. The fact that the cookie dough takes a bit of baking powder makes them puff a little bit, so rolling the dough to about 3mm thickness should be perfect. You will end up with a bit more scraps of cookie dough left. They are great to nibble on, and even recalcitrant dogs will do amazing tricks for a little bite. The mousse component: My biggest mistake until now was over-whipping the cream. Intuitively, I felt that beating the cream to a certain point (pretty well-formed peaks) was important to make sure the mousse would hold. Not the case. Watching the pros do it in videos was an eye-opening experience. The cream is whipped to the point of “melted ice cream” and that’s it. If you over-beat it, it affects the final structure once frozen and you might have some cracks and problems when un-molding the cake. Plus, the mouthfeel will be compromised, a perfect mousse texture needs the cream to be whipped just to that stage. Live and learn. The Silikomart Eclipse Mold: I think it’s a great investment (and for 9 bucks, not at all bad) if you want to take your dessert-making up a notch. It is pretty straightforward to use. Keep in mind you will always be assembling the cake upside down, so what’s at the bottom of the mold ends up on top. There is a solid, white base, you fill it almost to the top with your layers of mousse, cake, biscuit, then place the top part over it. Then the final bits of mousse and a solid base will be added (although you can do a mousse-only concoction). The main thing to keep in mind is to make sure your mousse does not have air pockets near the surface that touches the mold. Go with the back of a spoon and delicately make sure to push the mousse on the sides. Another thing to keep in mind, is that your first layer of biscuit or cake will float on the mousse at the bottom – you must be gentle not to push it too hard down, or it will show on the surface of the cake. And do your best to keep it leveled. These are small details, but each one will affect the end result. It’s not easy to end up with a perfect entremet like the pros do at the drop of a hat. But it’s a fun adventure to tackle. Link to amazon here (I am not affiliated, will make no money from your purchase). 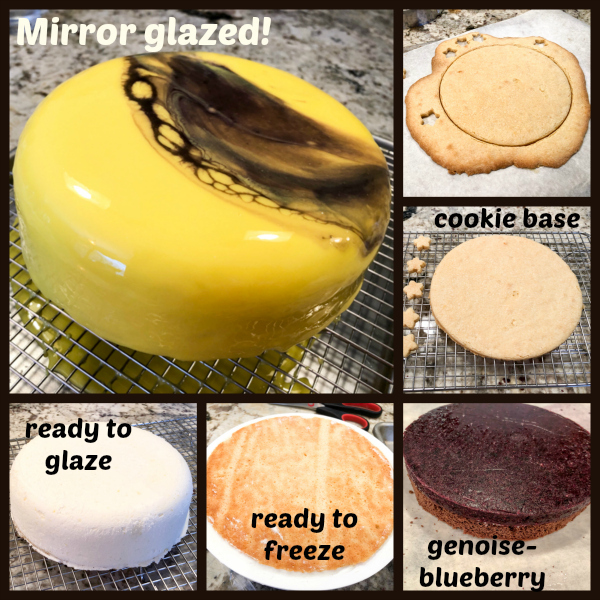 The mirror glaze: I am absolutely in love with this technique, and should thank Philip from Phil’s Home Kitchen (former Baking Addict) for his detailed tutorial and fail-proof recipe. Mirror glazes rely on gelatin to set. Gelatin is a tricky ingredient because you must use the right amount. A little less and your glaze won’t set. A little more and it will have a very unpleasant, rubbery texture. You also need to use the right gelatin – they all have a particular “bloom number” which is a measure of its strength or gelling power. Bloom numbers vary on a range of 30 to 325. Powdered gelatin is usually around 200, and sheet gelatin like Platinum is around 235. Obviously, the higher the bloom number, the less gelatin you need. But most recipes will tell you exactly which one to use, and there is some flexibility. For instance, in most applications, 180 and 200 can be used interchangeably. What really matters in a cake is the taste, and I must say this one delivered big time! I was a bit worried about the coffee extract in the glaze, because those ingredients can have a pretty artificial taste. However, I did not want to mess too much with the formula, adding real coffee to it in a larger volume. I was pleasantly surprised by the result, though. Perfectly balanced, not a hint of artificial taste to it. As you can see, it all worked reasonably well inside the Eclipse mold. My only issue is the thickness of the sable layer. Ideally, I would like to have it maybe 3/4 of that size, so that it would be more harmonious with the ganache layer and also the cake would slice better. Keep in mind that the mousse is delicate, so if you need to use too much force to cut the slice (because your biscuit layer is too thick or too hard), the whole structure will suffer. I think my favorite part of the cake was the caramel mousse. Once glazed, the cake must sit in the fridge for about 3 hours before serving. Yes, it is a labor of love, but without love, what’s the point? Once again I decided to push a little the limits of my comfort zone. Actually, let me rephrase that. With this project I threw caution to the wind and walked through pretty treacherous baking neighborhoods. When you buy a Silikomart Vague mold because you are mesmerized by its looks but have no idea what to use it for, you are in for a wild ride. It’s not as if you could order a cookbook called “Silikomart 101.” In fact, it’s hard to find even blog posts to help you out. Lots of amazing concoctions pop up in Pinterest, but instead of recipes they direct you to fancy patisserie pages in Paris, Rome, Prague. No help whatsoever to make them materialize in your own kitchen. Through some google-overwork, I finally saw a little light at the end of the tunnel through an Italian blog hosted by Vanessa (Tra Zucchero e Vaniglia = Between Sugar and Vanilla). Thanks to my limited ability to read the language and the help of google translate to fill in the blanks, I managed to put my beautiful mold to use. With this project, I also tried for the very first time an amazing technique: chocolate spraying with a paint gun. I know. I am gone. Beyond recovery. But… can we still be friends? In a large mixing bowl, whisk the all-purpose, almond, and hazelnut flours and the cocoa powder. In a separate bowl, combine the butter and brown sugar, then incorporate the flour mixture. Refrigerate for at least 1 hour. Heat the oven to 300°F. Line a baking sheet with parchment paper. Evenly spread the dough about ⅛ in thick onto the prepared baking sheet (the batter should be slightly larger than the cake ring that will be used for assembly). Bake for 12 to 15 minutes. Cool completely. Reserve. 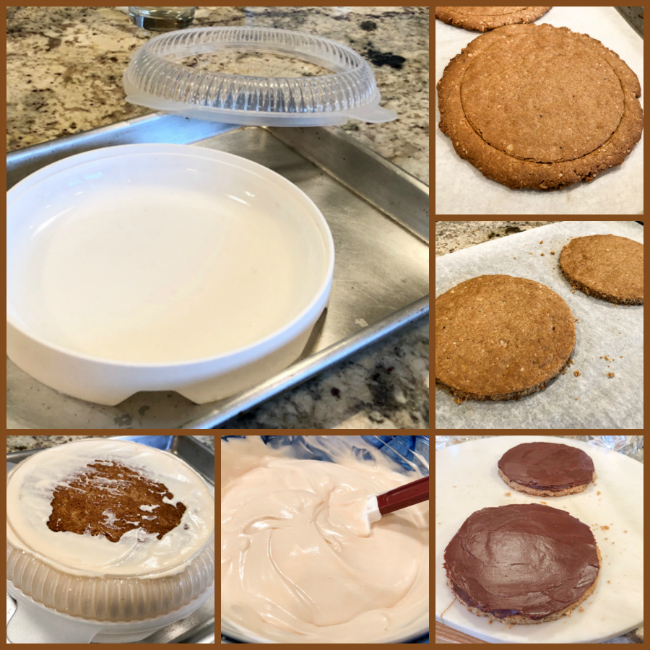 Coat a baking sheet with a silicone mat or parchment paper and place on it a 7-inch diameter flan or cake ring, preferably with a sheet of acetate lining it. On another baking sheet, place a Silikomart globe mold (optional). Soak gelatine in cold water. Put the beaten eggs, the granulated sugar and the fruit pulp in a glass bowl. Bring the mixture to 180 ° F in microwave at maximum power, measuring the temperature after 50 seconds. Continue to measure it every 30 seconds (it will take over 2 minutes to get there, depending on the power of your microwave). Once the indicated temperature has been reached, add the gelatine and mix well to dissolve it completely. Cool to about 105 to 110 F and add the butter, emulsifying with an immersion blender. Pour the cream into the previously prepared steel circle until it also fills one of the globe mold cavities . Freeze for several hours or overnight. Heat the milk and cream in a small saucepan until it starts to boil. Meanwhile, with a whisk mix the egg yolks, vanilla extract and sugar, taking care to incorporate as little air as possible. Add a small amount of the hot milk mixture slowly to the egg yolks to temper it, then slowly add the rest and blend well. Cook until it reaches 170 F. Pass the cream through a sieve and transfer it into a cold container to stop cooking. If necessary, use an immersion blender to make it fully smooth. But if you are careful heating it gently and constantly stirring it, it should not need any further blending. You will use 150 g of the creme anglaise for the white chocolate mousse, as follows. 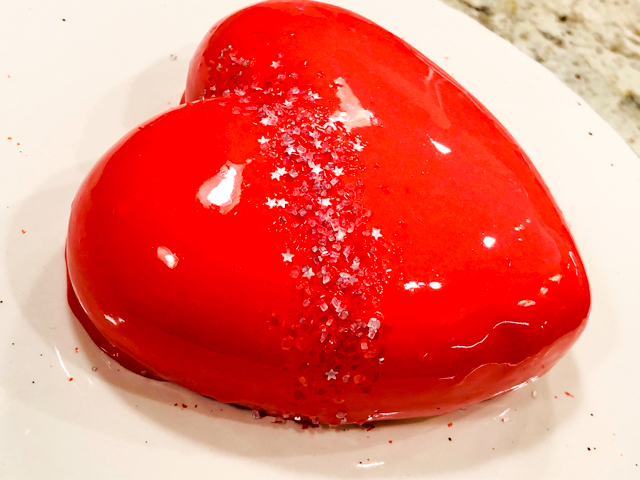 Chop the chocolate coarsely and melt it in the microwave with the defrost function or maximum power 500 W.
Warm up the creme anglaise to about 100 F. When the gelatin is soft, squeeze it to remove the water and add it to the creme anglaise. Mix gently to fully dissolve it. Pour the hot cream over the chocolate, wait a moment and mix well. Fold the whipped cream to the still warm mixture. Reserve. Melt together and place in sprayer at 90 F.
Assemble the dessert. Place the Vague mold on a baking sheet that will fit inside your freezer. Fill with the white chocolate mousse, making a thick layer at the bottom. Remove the raspberry creamy disc from the steel ring, removing the acetate and place it in the middle of the mousse making it sink a little. Cover with the remaining mousse and beat the pan gently on the countertop so as to bring out any air bubbles. Level the mixture with a spatula and transfer into the freezer for several hours, preferably overnight. 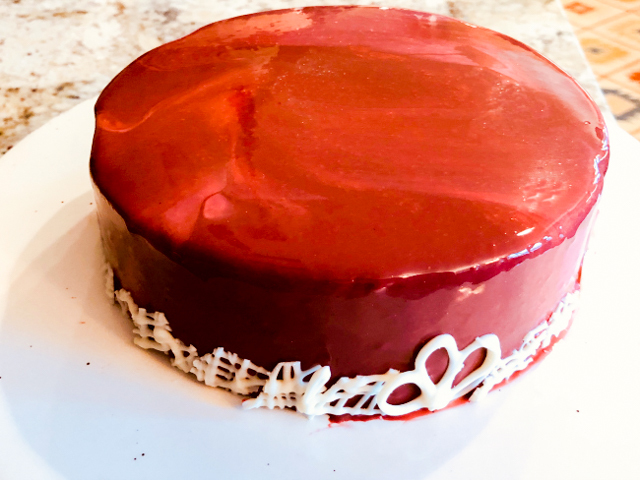 Once frozen, turn out the cake and spray it with the mixture of white chocolate-cocoa butter at 90 F. Make a light coating, otherwise the mixture might just slide off the surface instead of forming a nice velvet texture. Place the mousse over the cookie base, decorate the globe insert with a drizzle of white chocolate and set it at the center of the cake. Comments: I completely changed the cookie base, as Vanessa’s recipe had some unusual way to deal with it. In her method, you make a dough, cool it, grate it, and press it to make the base. I felt too insecure to give it a try, and also thought it was a bit too convoluted. Plus, I wasn’t sure it would result in the texture I wanted for the bottom layer of my cake. I opted for a chocolate sable instead. It is a nice dough to work with, and I love the texture. For this torte, you’ll need two Silikomart molds, the Vague and a small globe mode to make the center decorative piece that goes on top. You can definitely omit it and serve the mousse cake plain. But it does add a striking look to the dessert. A few things I learned through pain and struggles. You can see in my picture above that I used a silicone cake pan to make the raspberry insert. I had a pretty tough time un-molding it. The sides are too high, the material a bit too flimsy, I thought the whole thing was going to be ruined. Luckily, just a few boo-boos on the surface, no major harm done. Note to self: invest in a flan ring for this type of adventure. With a 7-inch metal ring, you simply freeze it and pull it up, leaving the perfect layer of mousse behind. Lesson learned. You need the right tools for the job. The velvet texture requires two things: the surface to be sprayed must be frozen, and the chocolate suspension must be at a maximum of 90 F, even a bit colder if possible. You need it to flow well, but to freeze immediately upon contact, forming the little velvety looking texture. Since the suspension needs to be passed through a fine sieve before going into the sprayer, things can cool down pretty fast. I decided to use my bread proofing box set at 98F to store the sprayer for 30 minutes or so. Then, I got the chocolate ready at the right temperature and worked as fast as I could to get the spray going. That brings another very important point: it is a very messy process. Very messy. People use all sorts of tricks to deal with it, usually doing it outside or in a garage with cardboard boxes forming a wall all around the piece to be decorated. But I found a tip that worked better than anything else: setting up the spraying unit inside the dishwasher! I just removed the racks, placed a baking sheet inverted on it, a plastic turntable to hold the cake, and that was absolutely perfect. All I had to do was run the dishwasher in the end. I watched quite a few youtube videos on chocolate spraying to make sure I would have some chance of getting it right. One thing is certain: no matter how many videos you watch, how many detailed instructions you read, nothing prepares you for the real thing. It’s a wild experience. The sprayer works very efficiently but it is very hard to see what is happening because there is a haze of spray everywhere. It was also not very easy to turn the cake while spraying, the Wagner is not feather-light. Plus, my heart was beating at 120 bpm, maybe faster. To summarize, things got intense pretty quickly. Let me rephrase that also: Hell broke loose, big time. I hope the next adventure will be easier, though. At least I am confident that the set up I designed works well to keep the temperature in the correct range for a while, I won’t need to rush to get it done. Apart from a few problems here and there, I am reasonably happy with the way my first adventure with the Silikomart Vague turned out. 1. A little more gelatin in the mousse so that it will un-mold with a more defined surface. 2. Place the raspberry insert slightly more on the center of the dessert, so that it won’t be at all visible underneath the top mousse layer. In other words, add a bit more mousse inside the mold before setting the insert on top. 2. The cookie base could be rolled thinner, but opinions are divided on this issue. Phil thought it was perfect the way it was. 3. Be a bit more Zen with the spray paint gun. There’s really no need to scare three dogs and a husband into hiding. Even if your contact lenses fogged up with the spray, no amount of screaming will make them clear up. That is a fact you proved to yourself. Next time, keep calm, and spray on. Make Sally and Bogey Quit That happy, grab a pin!